A few more red layouts as February is quickly coming to a close. I'm enjoying playing along with Brenda as she sews and quilts her red fabric scraps (her red and white lap quilt is gorgeous) and I cut and adhere my red paper scraps (check out my first red layouts earlier this month here). 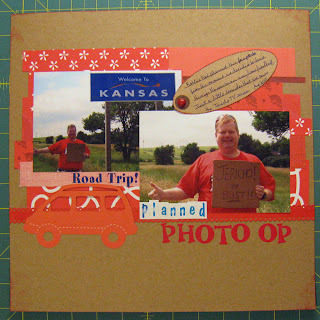 I am hoping to complete a layout a day for the next 20 or 30 days as one of the suggestions by Karen Grunberg in the Finding Your Way workshop, so here are the first two using some of my red supplies. 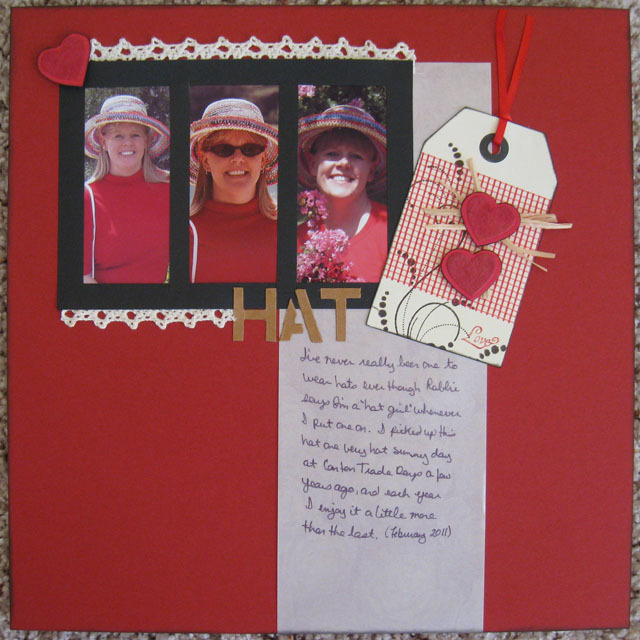 Finding Your Way Layout # 1 - Inspiration from Karen Grunberg's "The Unworn Hat" layout from the Embrace Imperfection Workshop. I used my red tag from Nic Howard's Color! Or is it Colour? Workshop as an embellishment. Finding Your Way Layout #2 - Inspiration from the photos of Robbie holding his homemade Jericho or Bust sign. Used up some red scraps and letter stickers for this one. Since this month seems to be flying by, I decided to take time to make my March cards. 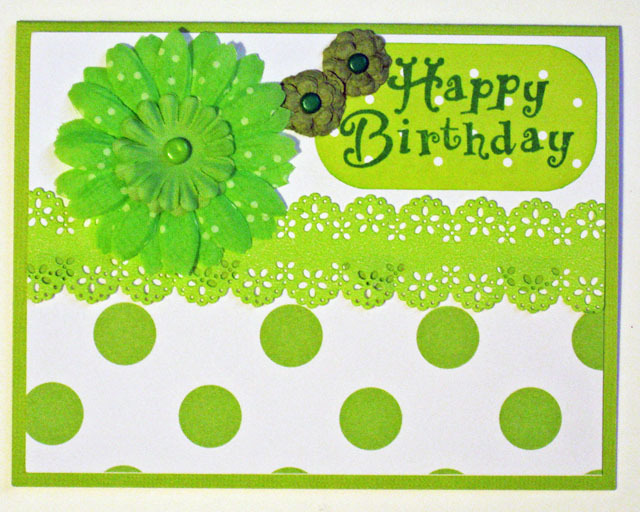 As it turns out, I only needed to make one birthday card for March! 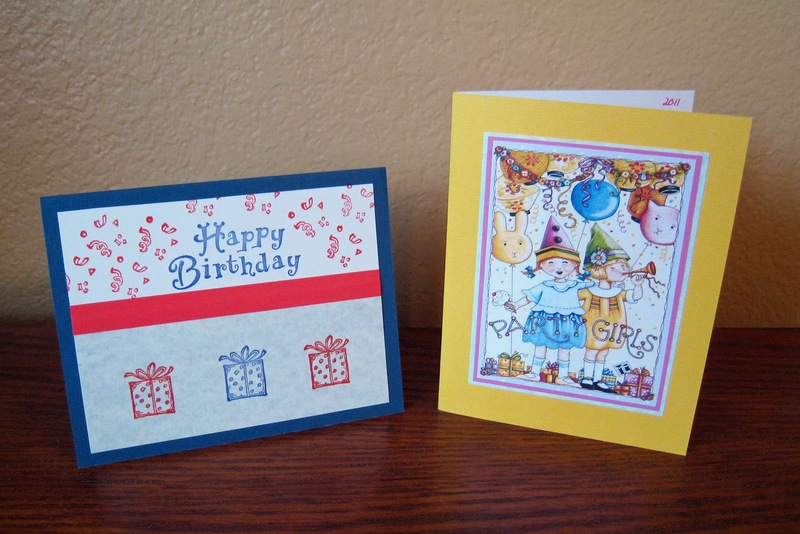 However, I had another late February birthday for a new friend, so I created two simple cards this week. I used a Mary Engelbreit picture on one card and some of my birthday stamps on the other, and voila, I'm all done for March in keeping with my goal of making cards the month before. Just a quick post this week to say that getting up at near the same time each morning is making a huge difference. I've ridden the stationary bike five times this week, most days in the mornings. My goal for March is to ride the stationary bike (or go for a walk now that the weather is prettier) for 30 minutes at least five times a week and add back in two sessions of strength training. I've added these sessions to my March calendar and feel good about staying on track now that I'm back into some routines. The Wellness Journey Workshop finished up this past week with a look at some of Lisa Cohen's favorite fitness tools, so next Friday I'll be sharing some of my favorites and how they've helped keep me motivated at times. Hope y'all have a fun and healthy weekend! 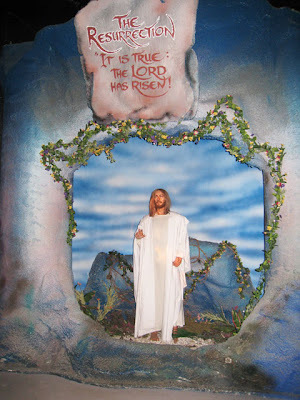 Today is confession day. 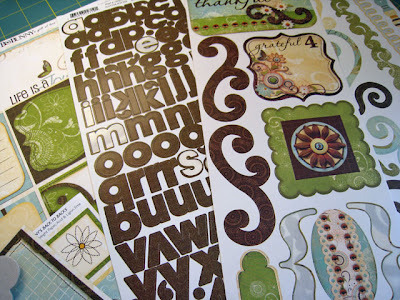 I have to confess that I blew my goal of not purchasing any new scrapbook supplies or online classes for six months. Ok, I guess that's really two goals - one for the supplies, one for the classes. Actually I don't think it was a complete failure since I did make it seven weeks without any purchases! It all started at the McKinney Trade Days last Saturday. I mentioned to Robbie that it would be fun to find an old hymnal that I could pull pages out of and use on scrapbook pages about my faith. Right away, he found one for a mere 50 cents! 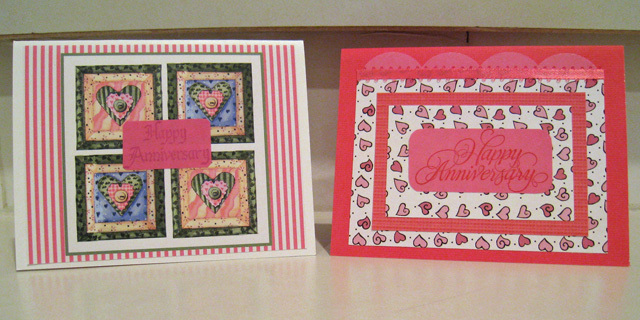 At another booth, I noticed a cute chipboard Stampin' Up mini-album and was able to pick it up for only $3. And then, since I'd already blown it, I figured it wouldn't hurt to stop at Scrappin' Bunnies, our local scrapbooking store, on the way home. I limited myself to one $20 bill and was able to pick up several new supplies. 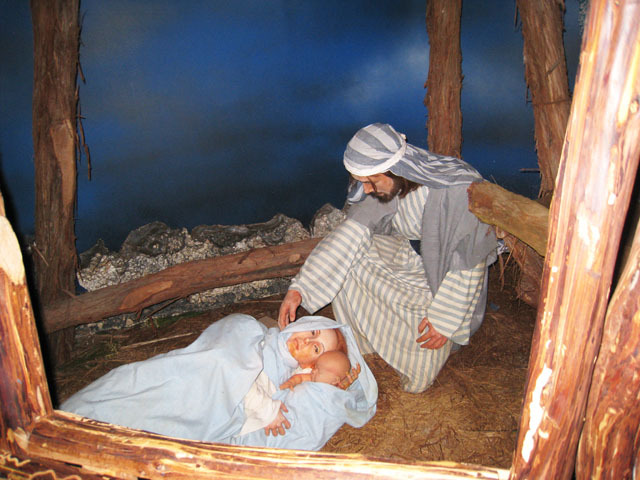 There's still time to sign up for these two workshops. 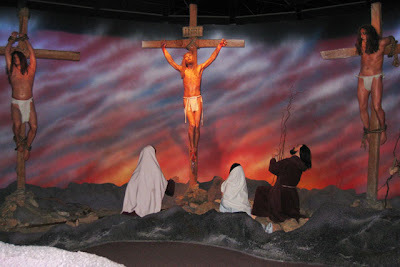 If you're not already a member of BPC, please click this link to create an account: http://www.bigpictureclasses.com/register.php?refer=DC8AF110. This link takes you to the page to create an account and also tells BPC that I recommended them to you. Once you purchase a class, you and I both will receive a 10% coupon off a future purchase! If you're not ready to purchase a class, I highly recommend that you create an account and sign up for one of the free self-paced classes and give them a try. My favorite free class is Start Here With Stacy. Well, that's it for me - anyone else need to confess that they've missed the mark on one of their goals for this year? During the Embrace Imperfection workshop at BPC, I enjoyed seeing Karen Grunberg's layouts as she gave examples of "imperfection." She has a distinctive style that includes long titles, lots of white space, and lines of stitching. 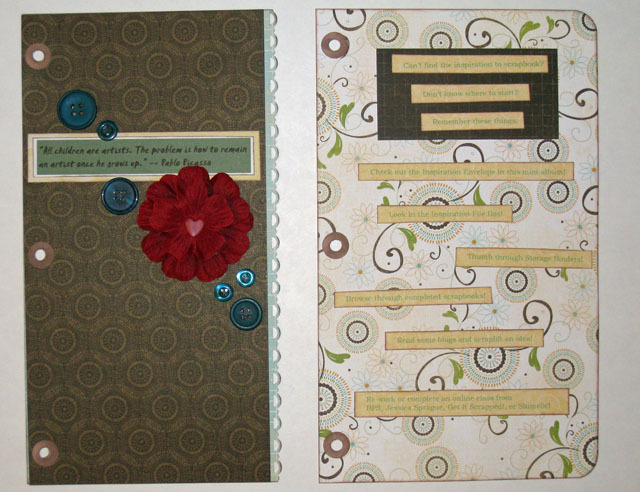 She also contributed to this month's Masterful Scrapbook Design series on Titles. I drew from all that inspiration to create a layout highlighting a photo of my great-nephew watching my dad as he worked to repair something at the desk (I can't remember now what he was trying to fix). I pulled a sheet of off white cardstock and the TEACH Bingo card from my stash. 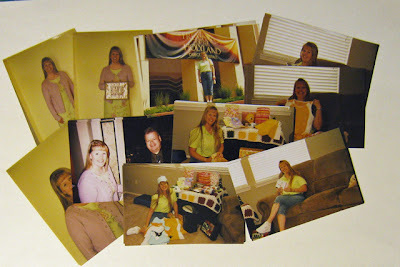 The photo mat was in my stash of items from some scrapbooking swaps I participated in two years ago. I recently sorted all my extra letters (stickers, die-cut, Scrabble tiles, foam, etc) by letter and have them near my craft table in a bin. I pulled the bin and found letters for the title. Such a fun layout to complete. Journaling Reads: I love this photo of Andrew watching Daddy working at the desk. It reminds me that we are always teaching by what we do each day. On another note, I was awarded the Liebster Award again! Thanks so much to Rachel for being a regular visitor and honoring me with this award. 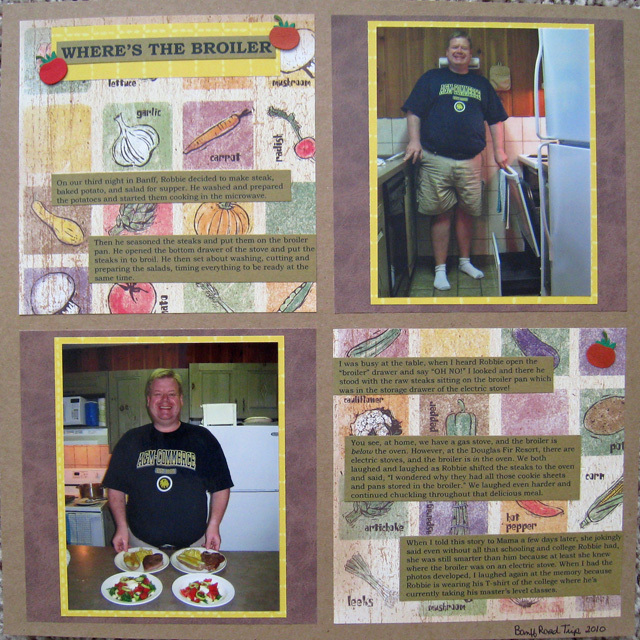 If you have a moment, stop in and see the layouts she's completed for her Document 2011 project. 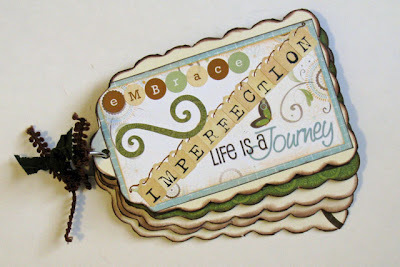 The free two-week Embrace Imperfection Workshop by Karen Grunberg at BPC is in its final week, and I have thoroughly enjoyed Karen's perspective on imperfections and the perfectionist tendencies that plague us in our scrapbooking. 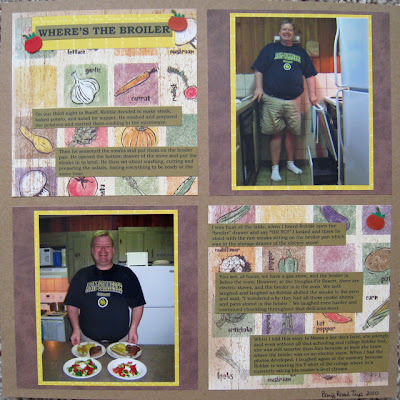 The final project for the class was to create a mini-album. The purpose was to create an album to tackle the idea of seeking perfection and to remind ourselves that perfectionism is overrated and that scrapbooking is about the memories. 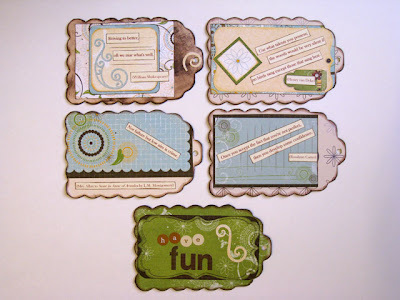 I created my mini-album this afternoon using a Mary Engelbreit Chipboard Book along with papers and stickers mostly from the Bo Bunny Flutter Butter line. I chose five of the quotes on perfection that Karen provided plus added three others from my Quotes Journal. I printed them onto cardstock and then laid out the papers and quotes to go on each page of the mini-album before I started assembling the album. 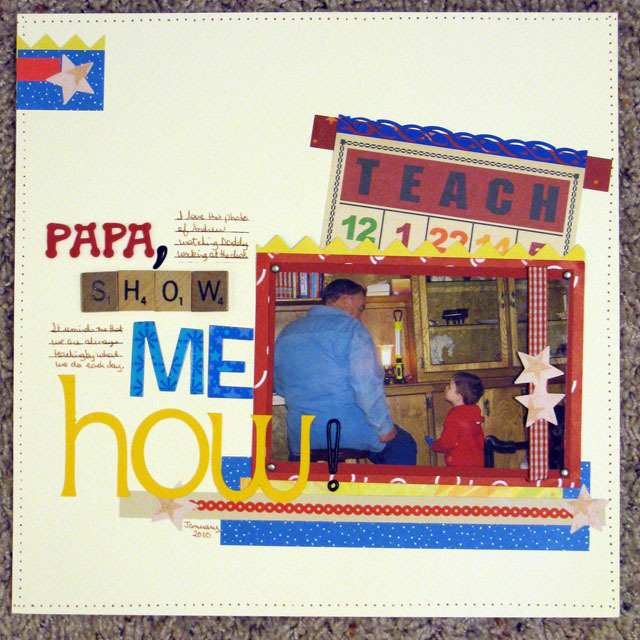 The chipboard album had five pages. Here are the fronts of each page, with the front cover at the top. And a close up look at the cover. The entire project took about three hours today. I really enjoyed putting it together and finally using one of the chipboard mini-albums I purchased (for $1 at Michaels) about a year ago. Mini-albums are so much fun to put together . . . maybe that's why I have a stash of them ready use. Anyone else keep a collection of mini-albums ready to grab when the inspiration strikes? 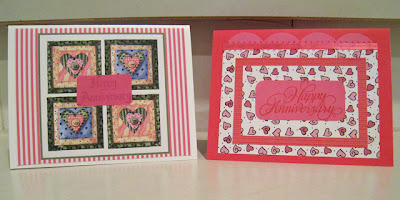 Now that all my February cards have been received, I thought I'd share my creations. 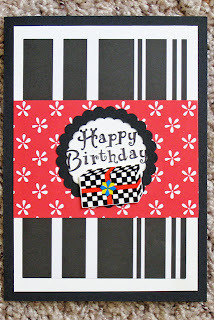 Most of these I created in January in keeping with my goal of making cards the month before they are needed, although the green birthday card was a last minute one that I threw together quickly. Hopefully this week I'll find time to create the few cards I need for March. 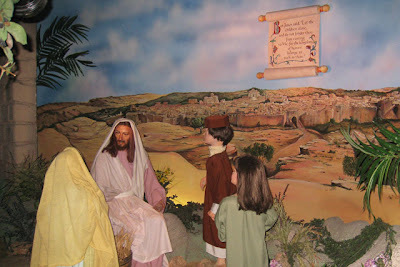 Jesus (as a young boy) in the temple. Jesus with the little children. 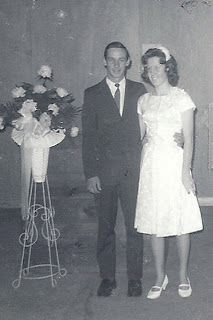 My parent's are celebrating their 45th wedding anniversary today. Here they are 45 years ago on their wedding day. This past week I've been concentrating on something that helps me to live a healthy lifestyle - routines. It seems it's always difficult to keep to our daily routines during the holiday season, and since the first of the year I've not really gotten back into a couple of the routines that help me the most, namely my morning and evening routines. Since Robbie is still searching for his next CFO position and I am not working outside the home, we really don't have a schedule. We don't have to get up at a certain time or go to bed at a certain time or be anywhere at a certain time. I have to admit that in a lot of ways, it's wonderful to have the freedom to structure our days. However, it is also detrimental in some ways because it is the routine and schedule of our weeks that help me eat healthy meals, maintain my exercise sessions, and get the sleep my body needs. I hope y'all have a fun and healthy weekend. 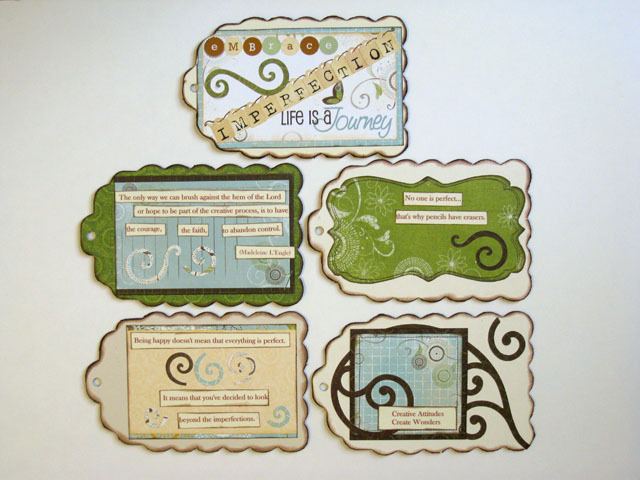 I had a request to see some of the individual pages in my Permission to Live a Creative Life mini-album, so thought I would do a quick follow-up post with some of the pages and a few more thoughts on the self-paced class at BPC. There were two components of the class, both of which I really enjoyed. The first is Courtney Walsh's thoughts on how important it is to give ourselves permission to create. Her thoughts and prompts for journaling throughout the mini-album are excellent and really encourage you to think about how you view your creative time. 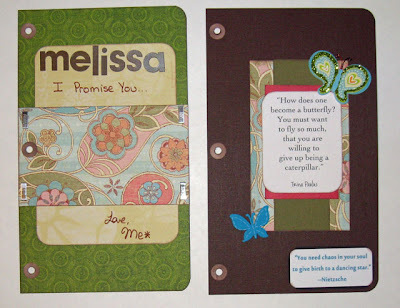 The second component was the mini-album itself and the easy to follow step-by-step instructions for each page. There were several ideas for pages that I've not used in a mini-album before, like using an envelope for a page or using the plastic sticker packaging as a pocket on a page. Here's a look at some of the individual pages in my album. Creativity quotes & envelope as a page to hold creative prompts. 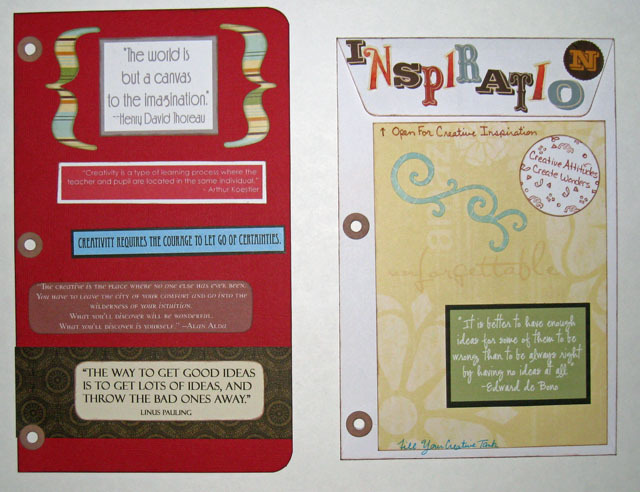 Pocket page for more creativity quotes & clear packaging to create pocket for dreams. Quote page (which is covering a page of journaling beneath) and things to do when my creativity has stalled page. Promises to myself page (promises listed under cover of patterned paper) and final page with quote. ﻿I would definitely recommend this class for anyone who feels guilty for taking time to be creative. 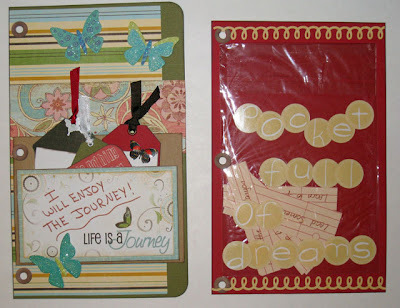 The prompts for journaling and the fun mini-album are well worth the $10 price tag for the class. 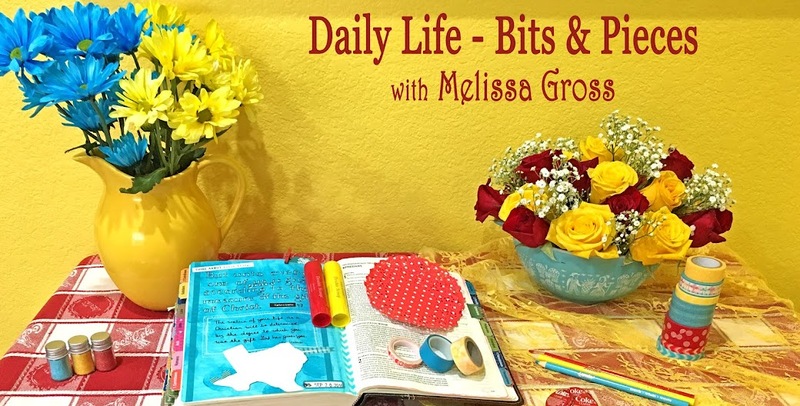 Permission to Live a Creative Life is the title of a self-paced class at Big Picture Classes. 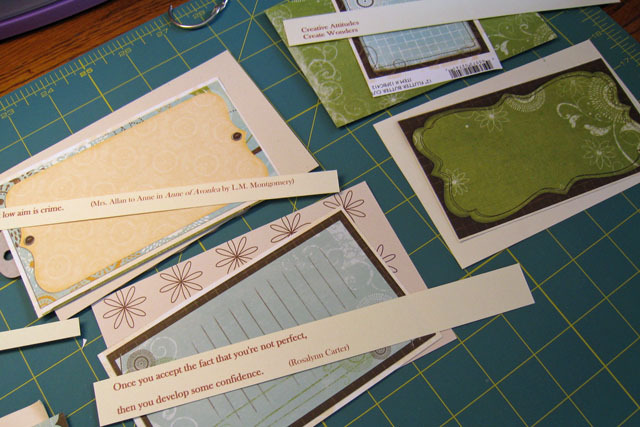 The class was designed by Courtney Walsh to encourage us to give ourselves permission to take time to create. I actually purchased this class early last summer and started the mini-album project for the class. I completed eight pages of the mini-album over the summer, then packed those pages away with the coordinating supplies I had pulled from my stash in a Project File. 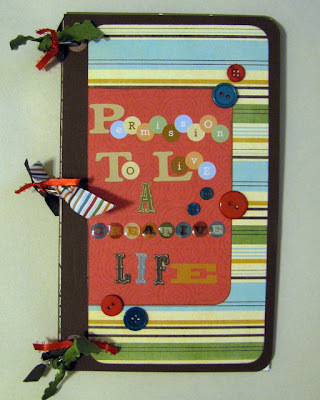 You may recall that one of my Scrapbooking Goals for this year is to re-work or complete the online classes I enrolled in last year and another goal was to complete several mini-albums that I had in progress (one of those being the Permission to Live a Creative Life album!). So, this week I pulled out my Project File and set to work completing the 12-page album. The course is designed to alleviate the guilt many people feel when they take time away from the "important" things in life to be creative. I have to confess that I don't really feel guilty when I take time to scrapbook or make cards or be creative. I do occassionally remind myself that there are other things that need to be done, like laundry or preparing meals or cleaning house. However, I have a pretty good schedule for keeping up with all those necessary things and typically can find time to be creative several times a week. 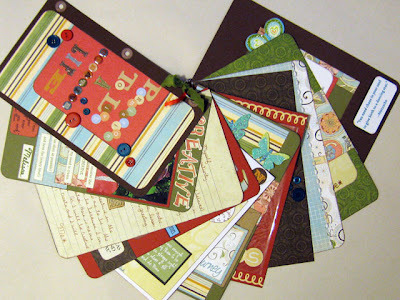 Thus, my focus in the mini-album journaling is more about affirming the fact that I am creative! I have always joked (and believed) that I am the least creative person in my family. Seriously, I was always the smart, pretty one in the family (oh, and humble, too! LOL). So, my mini-album is somewhat of a confirmation that I, too, am creative. 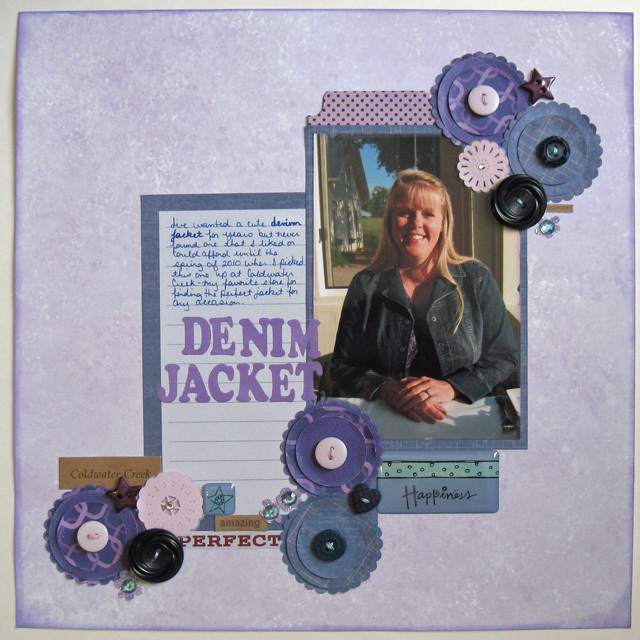 ﻿﻿I really enjoyed creating this 6"x10" album which will be on display in my craft room as a reminder to me that I AM CREATIVE! This month's color in the Rainbow Scrap Challenge that Brenda participates in is Red, so while she's quilting her red fabric scraps, I'm creating February Reds layouts. It's been a pretty busy month so far, but I'm hoping to get a few more red layouts in during the next couple of weeks. I created this first layout for the February 3 LOM Community weekly challenge to "create a Storage Binder layout with photos from four different storage binders." 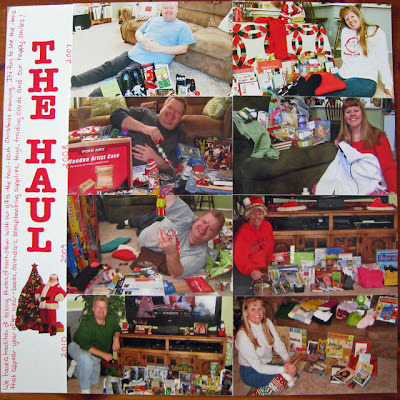 I pulled two photos from each of four different storage binders to create a layout highlighting our Christmas gifts over the past four years. Since this layout was so photo heavy, I simply used red letter stickers for the title, a Santa Claus sticker for embellishment, and a red pen for the journaling. Journaling reads: We have a tradition of taking photos of each other with our gifts - the haul - each Christmas morning. It's fun to see the items that appear year after year - books, calendars, scrapbooking supplies, toys, trading cards, and our happy smiles! The inspiration for this next layout came from a layout on page 13 of the January issue of Creating Keepsakes magazine. I scraplifted the title and basic layout design. 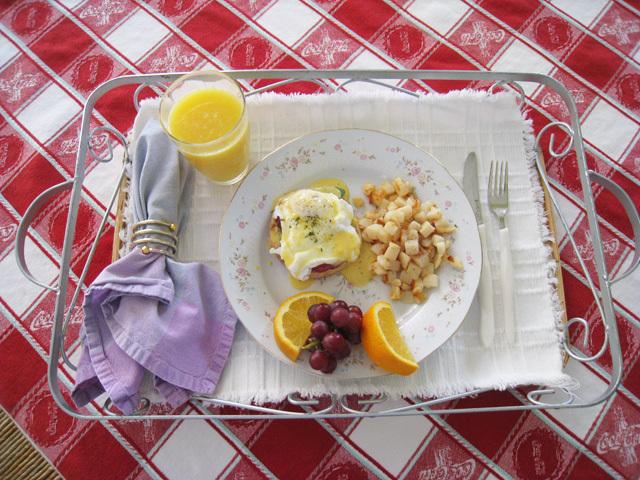 Since I was not feeling well yesterday, my dear sweet Robbie brought me this wonderful breakfast in bed this morning. What a wonderful way to start the day! This week's challenge in the LOM Community was to think of a story I've been wanting to tell, type it up and find photos to go with it. I had printed photos to go with a hilarious cooking story about Robbie from our Banff Road trip this past summer and decided it was time to get that story and those photos scrapped. On our third night in Banff, Robbie decided to make steak, baked potato, and salad for supper. He washed and prepared the potatoes and started them cooking in the microwave. 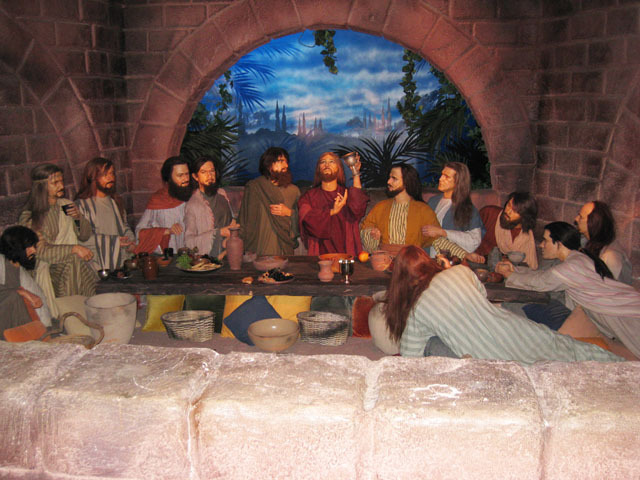 Then he seasoned the steaks and put them on the broiler pan. He opened the bottom drawer of the stove and put the steaks in to broil. He then set about washing, cutting and preparing the salads, timing everything to be ready at the same time. I was busy at the table, when I heard Robbie open the “broiler” drawer and say “OH NO!” I looked and there he stood with the raw steaks sitting on the broiler pan which was in the storage drawer of the electric stove! You see, at home, we have a gas stove, and the broiler is below the oven. However, at the Douglas Fir Resort, there are electric stoves, and the broiler is in the oven. We both laughed and laughed as Robbie shifted the steaks to the oven and said, “I wondered why they had all those cookie sheets and pans stored in the broiler.” We laughed even harder and continued chuckling throughout that delicious meal. 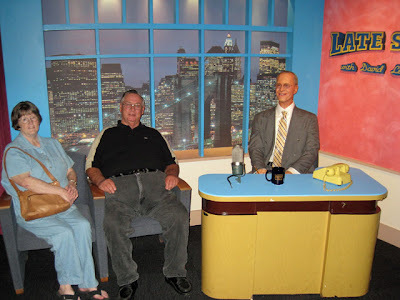 When I told this story to Mama a few days later, she jokingly said even without all that schooling and college Robbie had, she was still smarter than him because at least she knew where the broiler was on an electric stove. When I had the photos developed, I laughed again at the memory because Robbie is wearing his T-shirt of the college where he’s currently taking his master’s level classes. 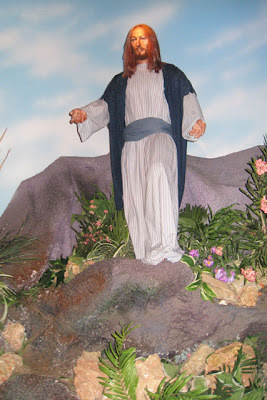 We have told this story so many times since returning from our trip that Robbie thought I'd already scrapped it and shared it on my blog! The story is even funnier for those who know that Robbie and I both love to cook (and are pretty good at it most of the time!). Do you have any funny cooking stories - do tell! This week's Wellness Journey topic was all about journaling and gratitude as a part of total wellness. I actually started a Gratitude Journal during last year's workshop where I listed five things I was grateful for each day. As this new year began, I changed the format in my journal and am now writing two sentences each day - the first is a thank you and the second is a prayer for today. I did not reach my goal of five days of exercise this week, riding the stationary bike for 30 minutes; however, I did complete three sessions (and technically I still have today which may increase that number to four). Yesterday I had a terrible migraine and ended up in bed for the afternoon and evening. I'm not sure if it was brought on by sinus pressure from all the temperature and weather changes we've had this week or the fact that I spent the entire morning working on and filing our income taxes! I feel great this morning and am looking forward to a fun Saturday of scrappin' and enjoying the beautiful sunshine. 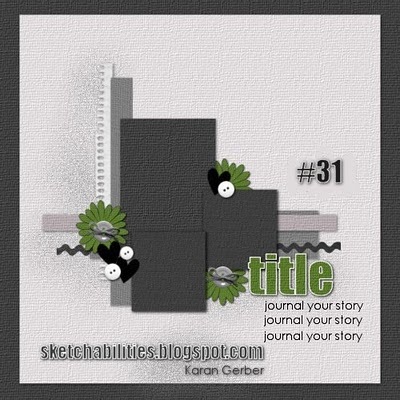 Once again today, I am the Guest Designer at Sketches in Thyme and this week's Thursday Takes #35 sketch is from Sketchabilities. I enjoyed using this great sketch to create a layout. 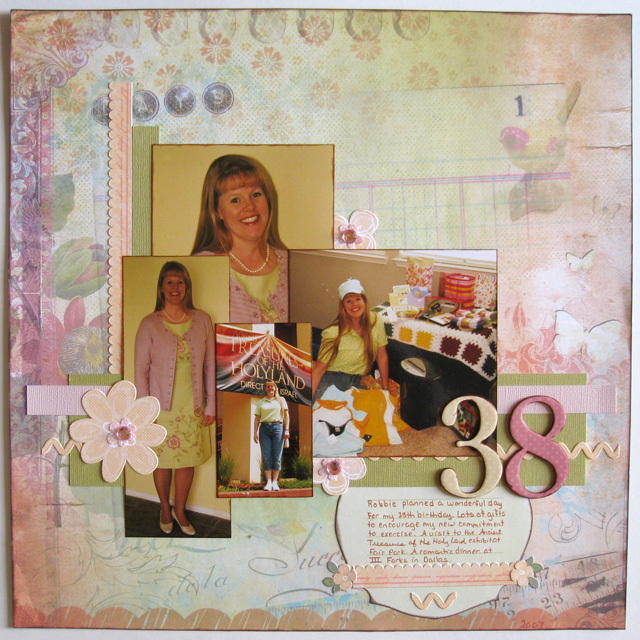 I started with the January 20 LOM Community Challenge which was to "create a Storage Binder layout of an event with more than 10 photos. Use only four on your page. Triage the remaining six photos behind at least three different tabs in your category drawers." 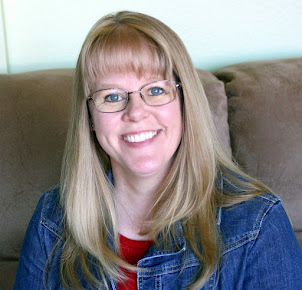 I chose the photos from my 38th birthday. I used four photos on the layout and triaged the remaining six behind the following tabs in my Category Drawers: All About Us/Melissa, Days We Celebrate/Birthdays, Things That Matter/Clothes, Places We've Been, Activities We Enjoy/Eating. This layout will go in our Days We Celebrate LOM album. I hope you'll join in this week over at Sketches in Thyme. I'd love to see what you do with this great sketch. I've finished several books over the last few weeks and decided to post short reviews of each of them today. 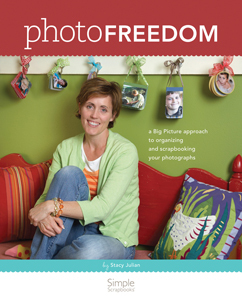 I love this book that outlines Stacy's Library of Memories system. This was my third time to read through the book over the last couple of years, and I always get inspired to implement something new in my LOM system or get an inspiration for a layout. Stacy recently posted plans for the upcoming LOM 2011 workshop and I'm looking forward to making adjustments and additions to my system again during that workshop. 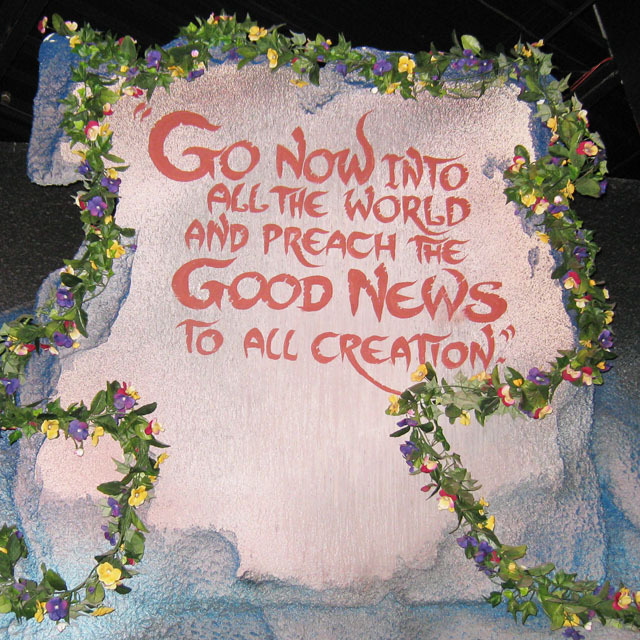 This book is the second in the Great Lives from God's Word series by Swindoll. 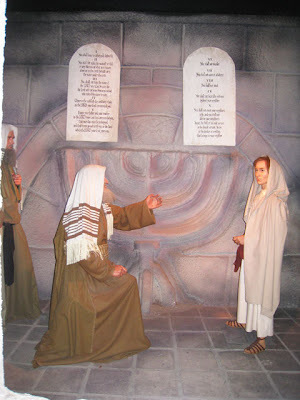 In this book he delves into the story of Esther, revealing God's hand at work throughout the story. This was my third or fourth time to read this book. I was motivated to re-read it in preparation for the talk I gave several weeks ago at the Ladies' Meeting at our church and the Bible Study I'll begin teaching this week. "we look back, we don't remember the times of celebration, the great birthday parties, memorable wedding anniversaries, the joys of an evening around the fireplace, the pleasures of family togetherness. You know what we remember? We remember things like earthquakes or tornadoes or hurricanes or floods." One of the things I love about scrapbooking is that it allows me to remember and record the times of celebration in my life. It also allows me to document the adversities and difficult times that I've come through. I'm looking forward to a little reading time later today since we have once AGAIN received some snowfall here in the we-shouldn't-have-this-much-snow-in-one-year state of Texas! Please let me know if you've finished any good books lately. This year I've discovered the free monthly classes over at Two Peas in a Bucket, and the end of the month class is led by Shimelle. The class is called 4x6 Photo Love and will highlight techniques for using 4x6 photos on a layout; one photo in January, two photos in February, and so on until there are twelve photos in December. I really liked this month's layout featuring one photo and a loose string of embellishments crossing the page from the top right to the bottom left. Shimelle featured some great pre-made round flowers on her layout, however I didn't have any large round accents. 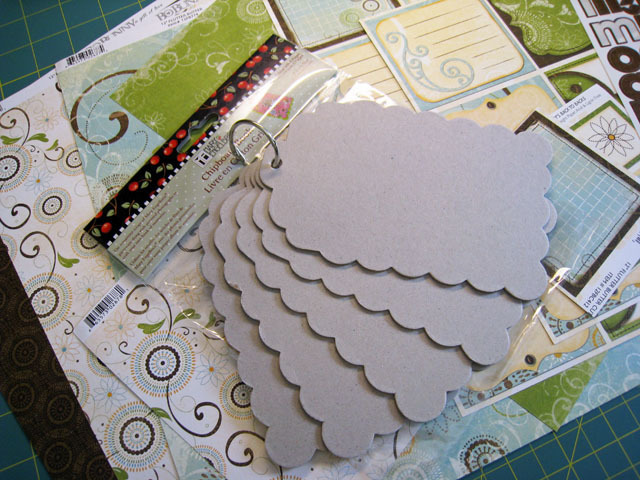 So, I decided to make my own using a scallop punch, two circle punches, patterned paper, buttons and ink. 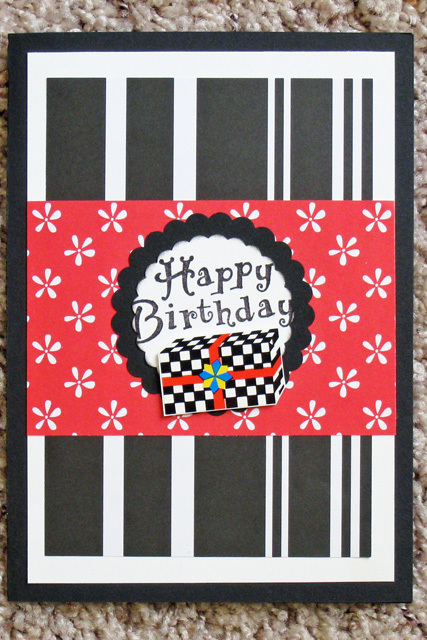 I layered the patterned papers, turned the edges up just slightly, inked the edges, and added a button for the center. Then I added other various size buttons and embellishments from my stash. 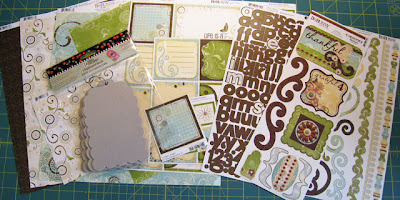 I also included a small piece of ephemera on this layout - did you see it? I have a box for cultural memorabilia that I started collecting during the LOM workshop last year. 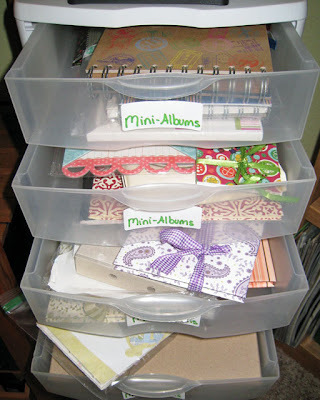 It's just a place to keep little tidbits from our daily lives that might be of use on a layout. I haven't actually used anything out of the box, until this layout. When I was writing my journaling, I remembered that after my last trip to Coldwater Creek, I had put some of the price tags in my cultural memorabilia box. All the price tags at Coldwater Creek are on a Kraft type paper, so I simply cut the store's name off one of the tags and included it with the word stickers I used in my loose embellishment line. 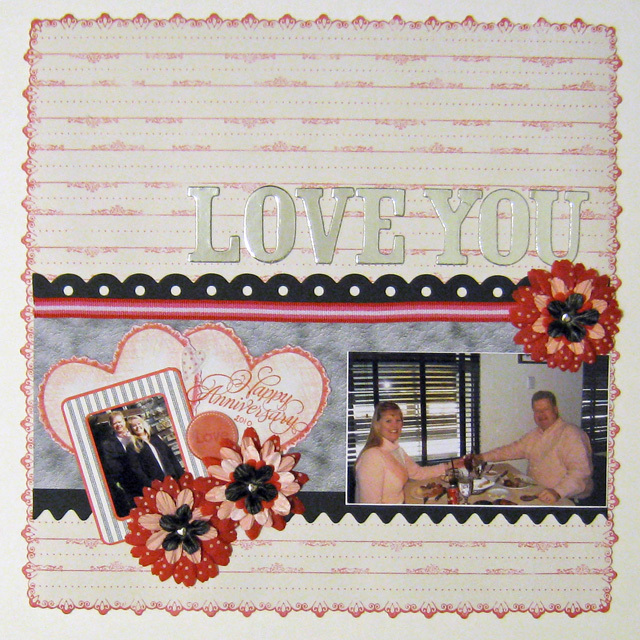 This was a fun layout to create and I'm looking forward to each month's 4x6 Photo Love class.